For those familiar with my blog, you know I like to post research updates and exercises that prevent injury and maximize performance. In my setting, I get to work with a very active population ranging in ages from 10-50 in most cases, including elite and professional athletes. I am pointing this out simply because I have an opportunity to test and measure unique and challenging exercises every day with fit, athletic clients. As part of my world, I am often faced with restoring shoulder, core and hip stability. As clients progress through rehab and conditioning, I am always seeking advanced training options that are feasible and functional. One training tool I like to employ, especially in upper body, core and hip training is the BOSU Balance Trainer. Emphasizing co-contraction and scapulothoracic and glenohumeral stability is essential for optimal shoulder function. But more importantly, addressing kinetic chain function in the shoulder, torso and hips is a must if we are to soundly address energy leaks and reduce injury risk. To that end, I like to incorporate unstable closed kinetic chain training when my athletes are ready. The video below demonstrates two upper body step-up progressions (forward and side-to-side) on the BOSU Balance Trainer that I utilize for higher level clientele. This regression can also be a very effective training tool especially if the client lacks sufficient strength, endurance and form to execute the full step-up patterns. Pain and form should always guide exercise selection and progression. As a therapist and fitness enthusiast, I always want to know the “why” and implications for exercises. I have posted on modified push-ups in the past, but I felt compelled to share some information that was published in the October 2012 Strength and Conditioning Journal. Bret Contreras et al. discuss the biomechanics of the push-up and provide an excellent overview of the different types of push-ups and what research has to say about them. Mastering form, alignment and strength with stable push-ups is common sense, right? So, do not advance to unstable push-ups without pre-requisite strength and satisfactory technique in a stable environment. Wrist mobility, shoulder stability, and core strength are just a few other key factors that should weigh in your decision to implement unstable push-ups. Considering some isometric work with slightly bent elbows or even some small pulses can be effective in progressing toward these more advanced unstable push-ups. Clients need to understand the point of no return and I prefer to spot closely particularly when using a stability ball or BOSU Ballast Ball. Working with the BOSU (dome side down) is generally safer and allows for easier modification with the knees on the ground for those with less upper body strength or diminished control. I also like to add a plus (scapular protraction at the top) to help counter the loss of serratus activity seen with BOSU push-ups. In the end, I really like using the unstable surface as the point of balance and have for some time. There are many ways to do push-ups, but considering some unstable work has a good return for those clients whoa ready for it. Below is a picture of the BOSU Ballast Ball – I prefer it over the stability ball as it is less likely to slip out from underneath the client. 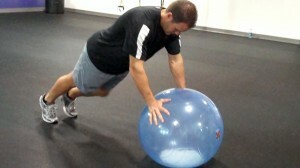 It provides excellent shoulder and core stability work – my primary goals when electing to use it. Reps, sets, progression and recovery will be dictated by fatigue and form at all times.